The Burning Man event is seeking a renewal of its 10-year permit to use the federally owned Black Rock Desert site managed by the Bureau of Land Management; the BLM has responded with a bizarre, overreaching Environmental Impact Statement that ignores the lavishly documented record of Burning Man's excellent safety and stewardship record. 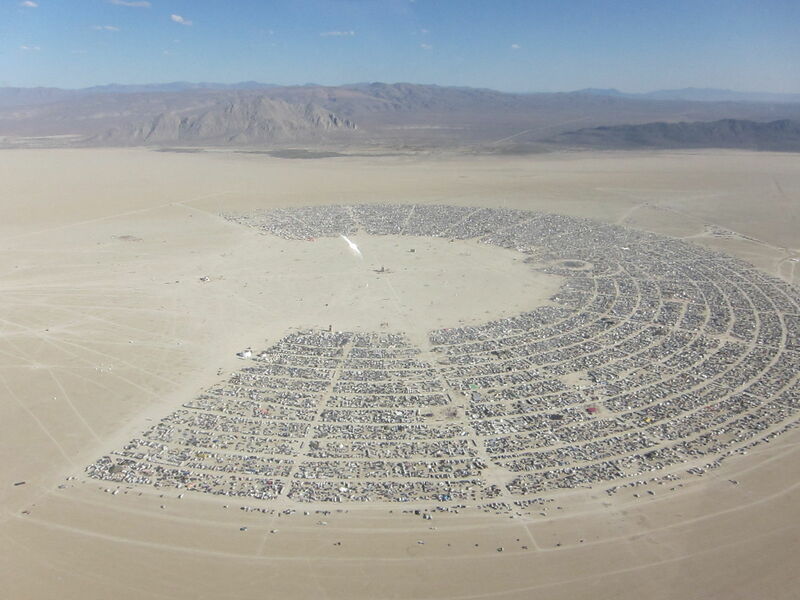 For example, the new Environmental Impact Statement calls for Burning Man to hire an outside security force to replace its all-volunteer, community-based Black Rock Rangers, and to have these rent-a-cops search all belongings of all attendees: 80,000 people in 30,000 cars, in a high-wind, low-visibility environment where, in addition to the threat to privacy there is also a massive risk of huge amounts of personal belongings being whipped away by the wind and blown all over the desert. The EIS also ignores Burning Man's status as the world's largest, best-managed "leave no trace" event, where every piece of waste down to individual sequins and metal shavings are picked up and packed out by attendees. Instead, the BLM wants Burning Man to install several football-fields' worth of dumpsters at the event's exit, with parking for 30,000 vehicles to pull up to them. In addition to eroding the norm of stewardship and waste-management that is intrinsic to the festival, this would also deprive the nearby Pyramid Lake Paiute dump sites of the millions they take in from burners who pay to have their waste legally disposed of. The EIS also calls for the creation of a 19,000,000 lb concrete jersey barrier to encircle the site, replacing the trash fence (a wildlife-friendly fence that catches blown waste) and the perimeter patrols (which are hugely effective at catching people sneaking into the event). The concrete barrier would do untold habitat damage and cause scarring on the playa, as well as disrupting wildlife. There's lots more -- including a mandate for the festival to conduct anti-drug surveillance of attendees, volunteers and staff, which is simply out of scope of the National Environmental Policy Act. The Burning Man Organization has published an extensive backgrounder on the EIS's deficiencies and a guide to submitting comments to the public docket. I am a Burning Man attendee who has attended every year since 2011, and I'm part of the Liminal Labs theme camp, which celebrated its 20th consecutive year this year. I am a research fellow at the MIT Media Lab and a Visiting Professor of Practice of Library Science at the University of North Carolina, as well as a Visiting Professor of Computer Science at the UK's Open University. I am also a New York Times bestselling novelist whose 2013 book, "Homeland," features extensive action at the Burning Man festival. Burning Man is the world's largest and most successful Leave No Trace event. Our camp -- and every other attendee, almost without exception -- packs out *all* its waste. Every year finishes with a multi-hour scouring of our site with rakes and garbage picking tools to ensure that not so much as a single metal shaving or zip-tie remains on site. We take extensive measures -- tasking someone to travel to a paid dumpsite in a designated rental vehicle, then taking that vehicle to a car wash to make it presentable for return -- to ensure that our waste is properly disposed of. For the few bad actors who practice illegal dumping after the event, Black Rock City’s Highway Cleanup Team conducts exhaustive trash sweeps of not only of Routes 447, 446 and 34 (as required by existing permits), and also RT 445 and Jungo Road (which are not required, but whose cleanup is undertaken in the spirit of good citizenship). Our camp makes use of paid dumpsites on Pyramid Lake Paiute Tribal lands, infusing much-needed cash into one of America's poorest counties. Dumpsters would end this practice. Moreover the BLM's draft EIS does not contemplate the environmental impact of maintaining the dumpsters and providing space to service 30,000 vehicles to use them. The factual record -- which is publicly documented in a detailed annual report from the Burning Man Organization -- does not support the need for this requirement. As an expert agency, the BLM is not permitted by law to make policy without evidentiary support. Every year Black Rock City is one of the lowest-crime jurisdiction in all of the state of Nevada. There is no evidence to support the need for separate, private security forces onsite. Indeed, the Black Rock Rangers -- a experienced, community-based, all-volunteer force -- are among the most commendable and exemplary aspects of the city's management. Several of my campmates are volunteer Rangers, and I have seen firsthand how seriously they take these duties and how well they perform them. The environmental impact of gate-searches is significant: unpacking and repacking full cars in a high-wind, unsheltered, dust-storm environment will produce an unquantifiable -- but substantial -- amount of inadvertent litter, and expose people not suspected of any crime to substantial damage to their personal property, to say nothing of the privacy dimensions of these searches, which will force attendees to expose sensitive medical equipment, personal journals, literary and religious artifacts, and other private, sensitive and constitutionally protected materials to third parties. Without evidence of crimes or risks that justify these high financial, privacy, personal, and environmental costs represented by this measure, this recommendation should be dead on arrival. There is no evidence to support the need for jersey barriers, which will blight the land, impose a massive carbon footprint on the event, pose unquantifiable environmental risks, and burden the festival with unjustifiable and substantial financial costs. The existing trash fence, combined with Black Rock Ranger patrols and other longstanding measures have a very long track record of keeping trash in and unpaid attendees out. Without any evidence, the BLM should not ask the festival to spend $3m to install 19,000,000 lbs of concrete barriers in a sensitive desert habitat. Again, there is no evidence that existing ambulance and EMS services are insufficient to handle the existing rate of injury at the festival -- and ample evidence that existing measures are sufficient (per capita mortality and morbidity from all causes at Black Rock City are among the lowest in all of Nevada). I am certified in first aid and wilderness first aid and on two occasions I have used my training to help injured people at Burning Man, tending them while waiting for trained EMTs to arrive; in both cases, EMTs arrived in under 15 minutes. With the exception of wind-storms, the only dust I have seen at the festival that was present at sufficient concentrations to pose a health and safety risk was kicked up by law enforcement vehicles operated by local LEOs and BLM officers, who routinely flout BRC's 5m/h speed limit. If BLM is concerned about Black Rock City's air quality, they should train their officers to obey the law. The National Environmental Policy Act cannot be lawfully stretched to cover surveillance of this sort. It is grossly improper for BLM to request it. The BLM's Draft EIS reads like a farcical wish-list concocted in an evidentiary vacuum. Burning Man is a superb steward of public lands, a model for how other events should conduct themselves. Administrative agencies are not permitted to act without evidence. The festival's organizers and volunteers have painstakingly compiled and published detailed, longitudinal studies of the festival's *actual* environmental impact. This Draft EIS seemingly considers none of that factual record.